Many mindless minutes are spent sitting in airport lobbies waiting for flights to take off. 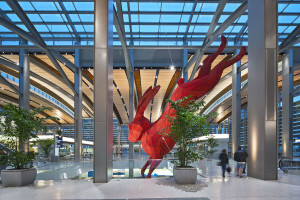 With lengthy layovers and constant flight delays, an arising popularity of art exhibits in airport terminals give passengers visual distraction from the stress of traveling and adds character to boring, neutral walls. 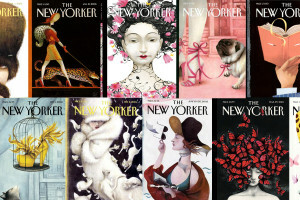 Each exhibiting artwork in their own unique fashion, some airports have permanent collections and installations, others prefer to rotate the collections based on a seasonal or local theme, and some combine the two. 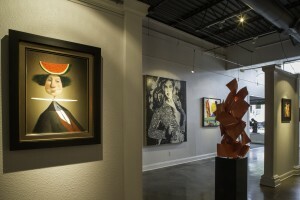 Permanent collections often embrace the regional culture, whereas rotating exhibits showcase local artist talent that millions of people view. Being the first airport museum to gain accreditation from the American Alliance of Museums fifteen years ago, you surely can’t miss the vast art collection at this airport. With over twenty different exhibits located throughout the Airport terminals, SFO is an arts and culture based destination. Terminal 3 has recently been renovated and unveiled a collaborative art installation called Sky by local artists, Franka Diehnelt and Claudia Reisenberger. 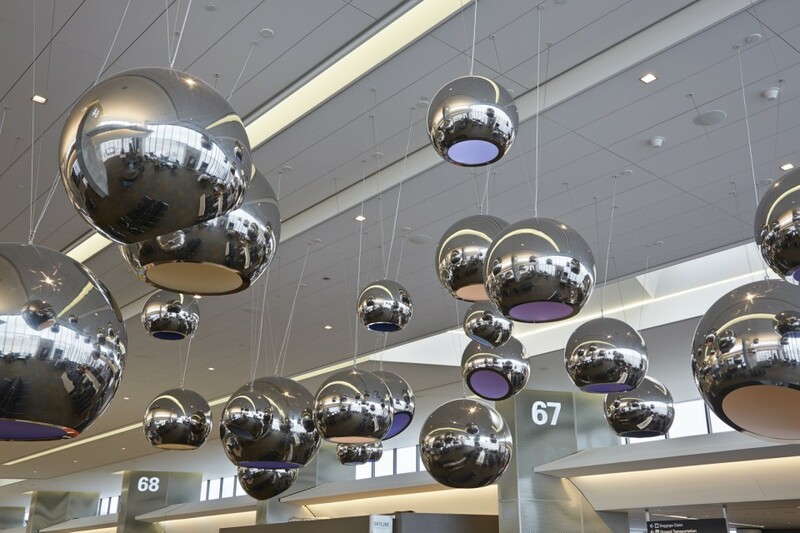 Twenty-seven mirrored spheres hang at different lengths from the ceiling and give the observer an abstracted view of light and color exploring ones perception of space. 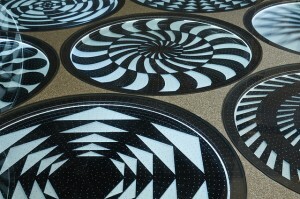 Another installation in Terminal 3’s children’s play area, is Spirogyrate by Eric Staller. This interactive installation also harnesses light, color, space, and responds to people’s movement. The modern, luxury terminal is a must see for any traveler at SFO. A luxury traveling experience at the airport ranked best in the world for multiple years, you’ll be hoping for more time before a flight so you can stay in the airport and explore! Travelers don’t have to leave the airport in order to get the feel of Korean culture with scheduled traditional performances, food, and The Korean Culture Museum. The museum has a 5,000 year timeline of Royal Culture, Traditional Arts, and Authentic Music. Among the artifacts in the exhibit is the oldest known wooden slab print in the world and the world’s oldest existing book published by movable metal type. Before getting on your flight, you will have time traveled throughout thousands of years of Korean culture and history without having to leave the building. 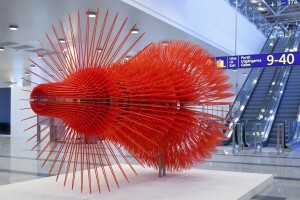 Airport art exhibits come in all shapes, sizes, and mediums. Along with many interesting, abstract sculptures, The Helsinki International Airport’s Art Collection has now added an Art Cinema installation located at Gate 37, where viewers can experience short clips by media artists portraying stories of various timelines in the city. This interesting, artistic concept allows passengers to relax and take a break from the stress of traveling, as well as, experience Finnish lifestyle and allowing native artists to show their work to millions of people. The themes for clips change regularly, differ in length, and have a variety of shows playing. Voted one of the best airports in the world, you are treating yourself if you have the opportunity to fly through this beautiful, serene airport. Filled with Kiwi culture, art, and large windows that overlook the pristine environment, Auckland Airport has invested a great deal to make passengers comfortable and relaxed during their time between flights. Along with art installations scattered throughout other areas of the airport, ten sculptures have been placed in the “art walk.” Opened in 2013, the new Esplanade is a walk in the park for travelers-literally, a landscaped park is located outside the airport and free for travelers to explore, including a trail surrounding a lake. Located inside is Artport store, a locally owned, tax free art retail store focusing on local, established, and upcoming New Zealand artists. If you’re into art collecting and the beautiful Asian Pacific, this is the airport for you! If you’re more of a kinesthetic learner and are traveling through Southeast Asia, Singapore’s Changi Airport is a site to travel by. Voted best airport in the world in 2013 and amongst numerous indoor gardens are art exhibits, sculptures, and interactive art stations located in Terminal 2 and Terminal 3. 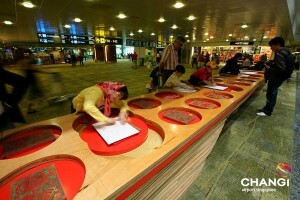 A popular art form of Singapore during the 1950’s and 1960’s, a Wood Block Rubbing Station is open for passengers to create personal works of art. Head over to Terminal 2 to observe the large Porcelain of Asia exhibit and immerse yourself in Peranakan heritage. Getting your photo taken with the vast collection of ceramic pieces and take a guess at mystery objects at the same place will surely be a memorable airport experience. Airports allow in-transit travelers to get a cultural sense of their location without having to step outside, it allows transferring people to see a part of the nation when it’s not their final destination. Standing in long, security lines waiting for a pat down and luggage to be x-rayed or boring hours beyond the check-in gate, a thought-provoking, visually stimulating art exhibit for passengers to enjoy is a light at the end of the tunnel.